It’s getting colder outside, but it seems to have only motivated the Backstreet Boys to bring more fire to Vegas this past week. Kevin, Brian, AJ, Howie and Nick made their return to Zappos Theater in Planet Hollywood last week to kick off their Fall 2018 run of shows in the last half of their residency. Did we mention that the residency recently won spots in the Best Resident Performer / Headliner, Production and Bachelorette Party in 2018’s Best of Las Vegas categories? They’re pulling out all the stops to prove that the show lives up to the hype… including an epic Halloween celebration! Audience members were treated to a throwback of sorts when the Backstreet Boys came back for their encore on Halloween night dressed in familiar outfits… but they weren’t the normal stage clothes. 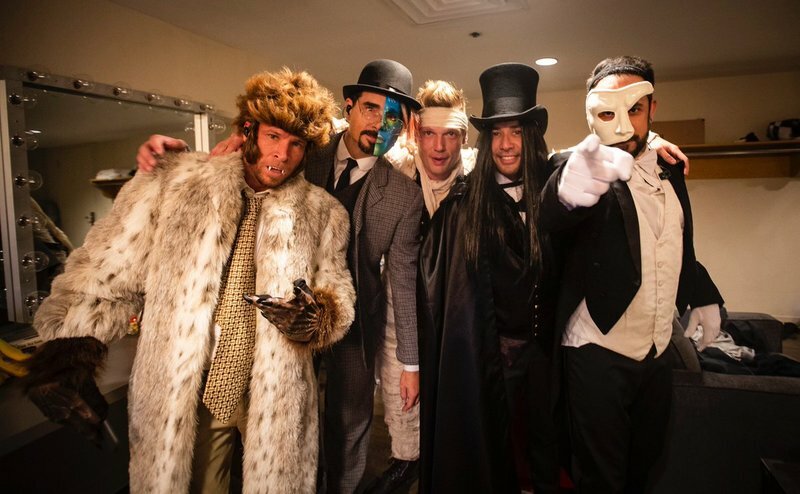 Instead, the fivesome recreated their looks from the infamous “Everybody (Backstreet’s Back)” music video much to the delight of fans, most of who were also in costume themselves. As if that weren’t enough of a nod to the spirit of the night, American Horror Story and Scream Queens’ Billie Lourd was the lucky girl to brought onstage during the Boys’ now infamous “Shape of My Heart” serenade, semi-unrecognizable in a Vegas-themed costume of her own. Lourd is the second familiar face to be serenaded in the past week (besides a few awesome fans). Watch What Happens Live’s Andy Cohen was spotted fanboying over Nick in the crowd on Saturday night before also being brought onstage to be sung for the Backstreet Boys to show him the shape of their hearts. “I’m totally a Backstreet Boy now!” Andy posted on his instagram page after the show, also sharing a photo of himself with the Boys backstage. With only two more weeks of shows left in 2018 and a new single, “Chances”, dropping on November 9th, there are only good things ahead for the band. Keep up with them on all social media channels as they reveal single artwork and more in days to come!